Secluded luxury honeymoon villa in Uzumlu nr. Kalkan. with super views. The bedroom has a large jacuzzi and a romantic circular double bed. There is a hydro massage pool and infinity pool outside. This brand new luxurious honeymoon concept villa is located in the peaceful village of Uzumlu, a short 10-15 minutes drive from the seaside resort of Kalkan. Constructed in local stone and with high ceilings that give as sense of spaciousness, this one bedroom villa provides an ideal setting for those couples wishing a relaxing holiday away from the outside world. Located at the entrance to the village, the villa is single storey with minimal amounts of steps, with car parking space adjacent to the villa entrance. There is an extra large jacuzzi within the circular bedded bedroom that adds the final touch of luxury to this superlative property. Whilst there are several other rental villa nearby, they do not encroach on the privacy of this villa. The totally private pool terrace, from which guests can enjoy the magnificent view across the valley towards Patara beach, includes an infinity pool of 7.8 x 3.5 x 1.45m dimensions plus a jacuzzi with hydro-massage jets, (2 x 1.5 x 0.5m). 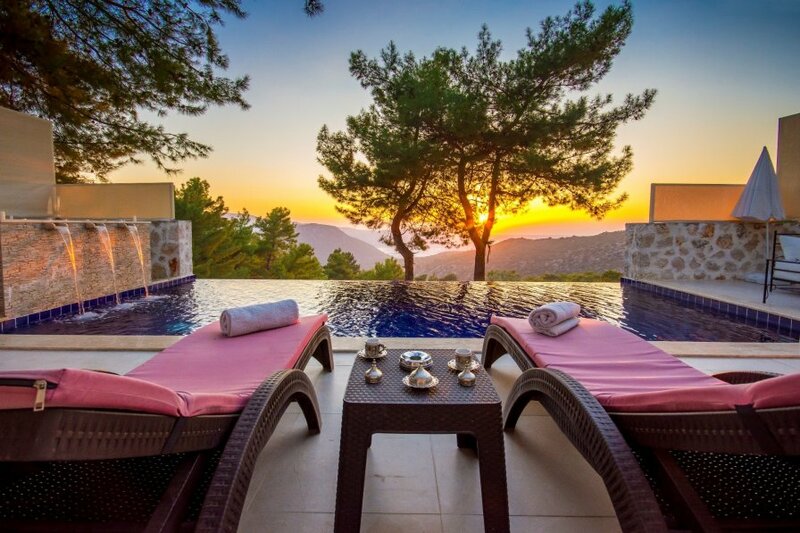 Situated on a hillside some 6 km from the sophisticated resort of Kalkan, it is recommended that guests have the use of a vehicle whilst residing in this villa. The nearest grocers shop and restaurant are approximately 1.5 km away. Local grocers will deliver to the villa free of charge.